Nikon does not offer a 5x macro lens. Only Canon offers this remarkable macro close-up focusing lens. We have had the Canon MP-E 65mm lens since 2007. This is a highly specialized lens. It takes lots of patience to use it (not due to poor design, but because of the narrow depth of field). If you are patient, if you use a tripod, and if the subject you photograph is photogenic, you can produce images that are remarkable. Just realize it is unlike any lens you have ever experienced. It is manual focus; the lens will need to be almost touching the object (so this is not a lens for skittish insects that fly or move quickly). But for some subjects, this lens is outstanding. 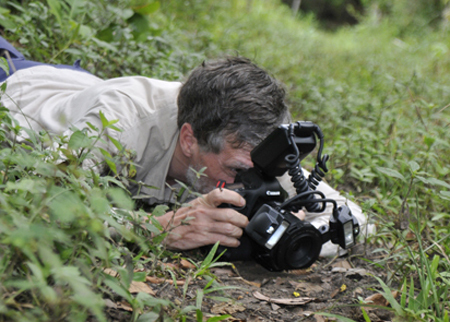 Nicholas Hellmuth photographing leaf-carrying ant, Sayaxché Petén 2010. Here I am photographing (or trying to photograph) a leaf-carrying ant which happens to be carrying a flower. 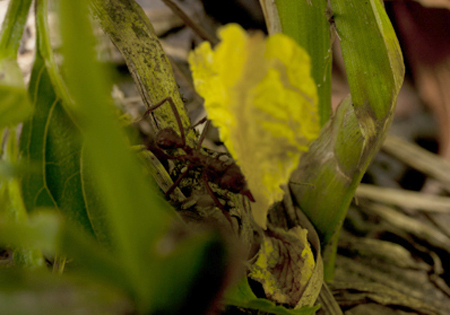 FLAAR does ethno-botanical research in the Maya area of Guatemala, and in certain seasons leaf-carrying ants harvest flowers instead of leaves. The ants move very fast and there is no way to focus manually unless the ant is somehow stopped in its tracks. This happens mainly when the ant is hung-up on a root or other obstruction. The day we photographed these ants (late December 2010), there were only two ants remaining on the trail. It was after 3 pm (possibly after 4 pm) and clouds were gathering. Most of the ants had dropped their flowers along the trail an hour or so before we had time to photograph them. If you wish to stop the ants in their tracks, you need a macro flash or other flash. Plus it would help to have a laser beam that triggers the photo when the ant passes a certain position (a position on which you have focused beforehand). Downside of the laser-triggered system is that we don’t have this system yet. And if you focus on one part of the trail, depth of field is so slim that the ant may be 1 or 2 mm off to one side (since their trails have a width that allows them to be anywhere on the trail). Leaf carrying ant, Sayaxché Petén 2010. Or, you can find a trail that has hundreds of ants, and simply shoot for hours, and then in the evening throw away the 90% that are out of focus, and concentrate on the perhaps 5% that are acceptable focus and save the 2% that are in good focus. We prefer not to spray or otherwise disturb the ants, nor harm them in any way. They have enough of a challenge surviving without us bothering them. Most people use the Canon MP-E 65mm macro lens to photograph insects. But you can also use this lens to photograph flowers. You need eternal patience to do stacked focus but the results can be impressive. List price is circa $1400; street price is $916 (as of January 2011). FLAAR photography teams recommend only what we actually have ourselves, and thus equipment we use year after year. 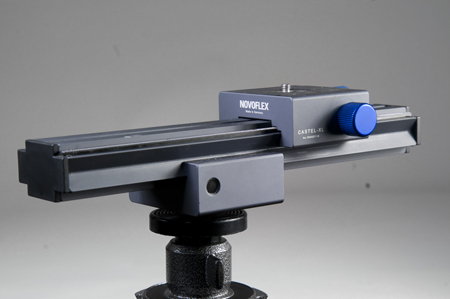 We have the Novoflex CASTEL-XL Focusing rack PRO MC and are pleased with it. If you want a sham review, pseudo-review, and spam-review, there are plenty available on every web site that tries to sell you digital photography equipment and accessories. Do these people really use the camera equipment they are pushing you to purchase? Hmmm, maybe they just want to get a sales commission or kickback from the reseller. We are very picky about what equipment we use, and if an item of equipment is iffy, weak, breaks down, or is inaccurate, we say so clearly. Several focusing rails that we have tried are too imprecise (in other words they wobble). The first focusing rail we tried was from Really Right Stuff (probably over 15 years ago; I would guess the current generation of equipment is better). It was not really what we needed and we have never really used it much. I prefer the more sophisticated engineering and the method of transport of the Novoflex CASTELL system. 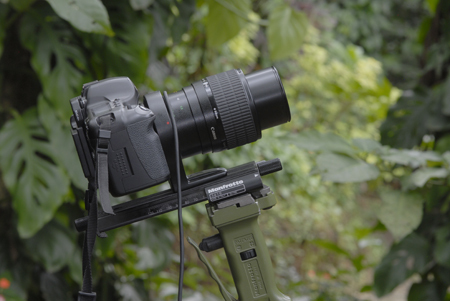 We have a Manfrotto 303PLUS which is a tripod head together with both forward and left-right system. Some web sites list this as a QTVR head; Manfrotto itself calls it an advanced panoramic photography head, to make it easier to reach the nodal point. My version seems to include a Micro-positioning Sliding Plate. You could probably attempt to use this for a focusing rail if you had to. Manfrotto 303PLUS - Tripod head together with both forwar and left-right system. We offer more information on focusing rails in an earlier report. 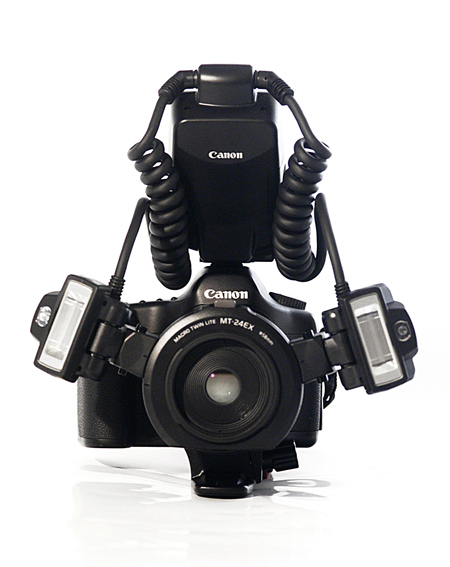 The MT-24EX Macro Twin Lite Flash is made for Canon Digital SLR Cameras. We have the MT-24EX Macro Twin Lite Flash system and take it with us to the field on field trips. However in the studio we prefer to use studio lighting and not flash or strobe. You will unlikely be able to use a camera-mounted flash such as a Canon Speedlite 580EX II Flash because your lens gets in the way. Your lens will be only a few centimeters, or millimeters, from the subject. There is no way a flash mounted on your camera can illuminate anything in front of the lens in this position. 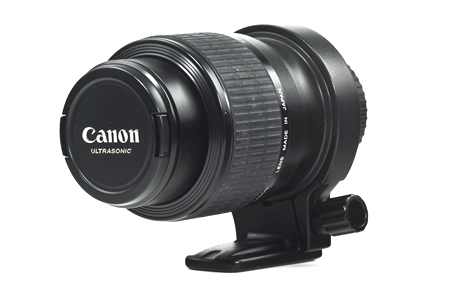 Canon MR-14EX Macro Ring Lite or any ring light such as the Novoflex ring flash are options. Ring lighting (around the lens) is very different than lighting from the side(s). One advantage of the Canon marcro ring light is that it can fire more light from one side than from the other side. This helps make the resulting photograph have more depth and pop to it.